The tucker box with a side beet and feta salad. The lamb and rosemary meat pie. A new type of cuisine has come to town — Australian. The Waltzing Kangaroo opened its doors in the Campus West Shops on March 14. The name seems to fit, because the owners of Waltzing Kangaroo first set up shop on the New South Wales Central Coast in Australia before venturing to find the perfect location in the U.S. to share their love of artisan Australian fare. What does an Australian eatery serve? Meat pies, pastries, tarts, quiches, coffee, ginger beer and craft brews. The store is basically destination comfort food. Meat pie options range from a Guinness steak and mushroom, to vegetables in Mornay sauce, to chicken in Thai satay sauce. The shop incorporates more traditional pies while adding hybridized pies, like Thai green curry steak. Over my two trips to Waltzing Kangaroo, I tried the sausage roll, lamb and rosemary pie, beef masala pie, the sweet potato side, beet salad and a flat white. Everything that I sampled was delicious. The lamb and rosemary pie had a rich, savory flavor with tender shredded lamb inside the flakey, buttery crust. The sausage roll was unexpected — it’s basically sausage wrapped in a puff pastry with spices. The beef masala pie had a similar richness but was heavier on spices for an Indian flair. The “Tucker box” on the menu is a great deal for lunch or dinner. 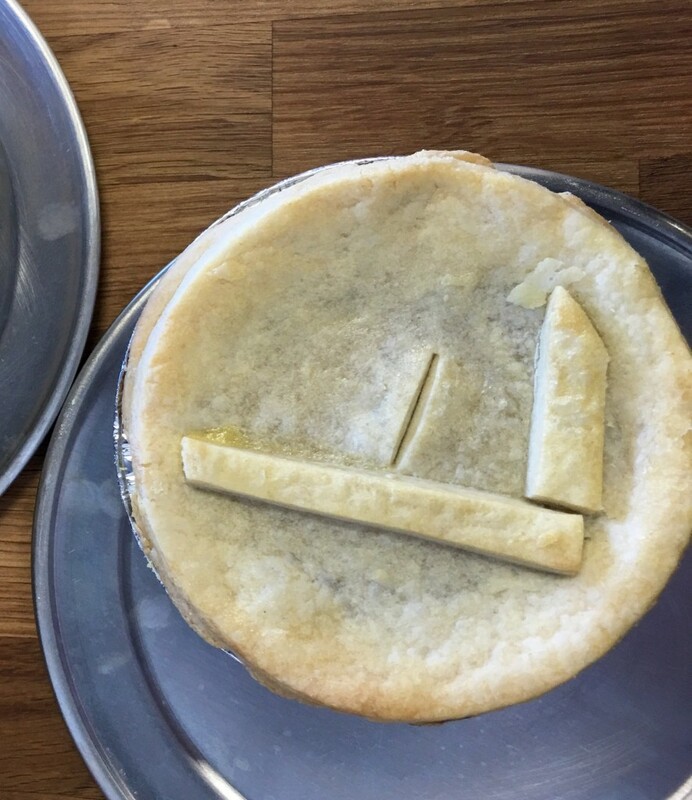 Your choice of pie and two sides are included for $10. Side options consist of mushy peas, mashed sweet potato, mashed potato, salad with sun-dried tomatoes or a salad with beets. “We also had a giggle at the ‘popular Australian side mushy peas’ pronounced ‘mooshy’ by the staff,” Strain said. The sweet potato side has a natural sweetness with just a hint of brown sugar, and the beet salad with feta, caramelized walnuts and balsamic vinaigrette added freshness to the box special. All of this savory had to be balanced out by some sweet — which is why the dessert menu is fairly large for the size of the store. Confections include profiteroles, salted caramel slices, tarts and vanilla slices with lemon icing. I have not yet had the pleasure to try one of these creations, but based on the quality of the pastry in the meat pies, I’m sure that I wouldn’t be disappointed. Yet another aspect of Waltzing Kangaroo’s offerings is its extensive drink menu. The restaurant has its own custom espresso machine, and brews beans from local source The Coffee Registry to create the Aussie favorite flat white along with lattes, cold brews and the like. It also offers juices, soda and a variety of beer. Waltzing Kangaroo is located at 1109 W. Elizabeth St. and is open Monday-Saturday from 7 a.m. to 8 p.m.